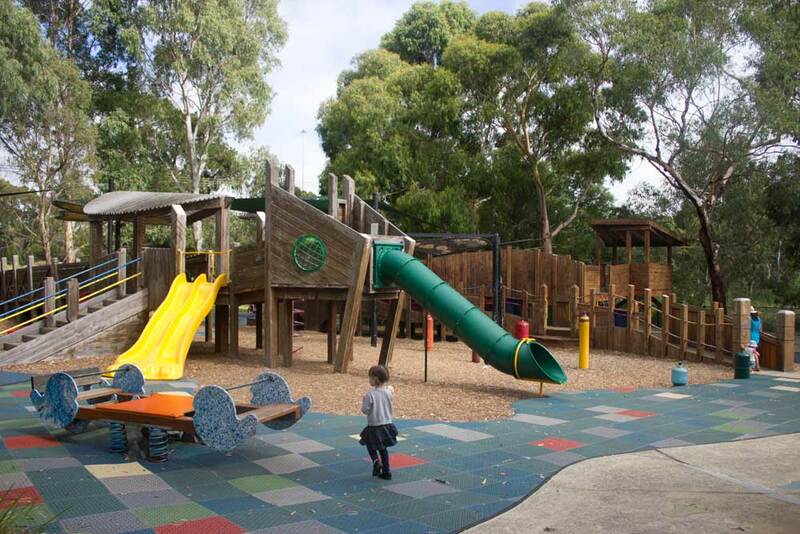 I know what it’s like to want to get out of the house with your tiny ones, but find most parks more suited to kids preschool-age and older, so I’ve rounded up some fabulous spaces across Melbourne that babies and toddlers are more likely to be able to use the equipment, and less likely to be bowled over by the boisterous big kids! I’d love to hear where your favourite places are for the smaller set – feel free to let me know in the comments. 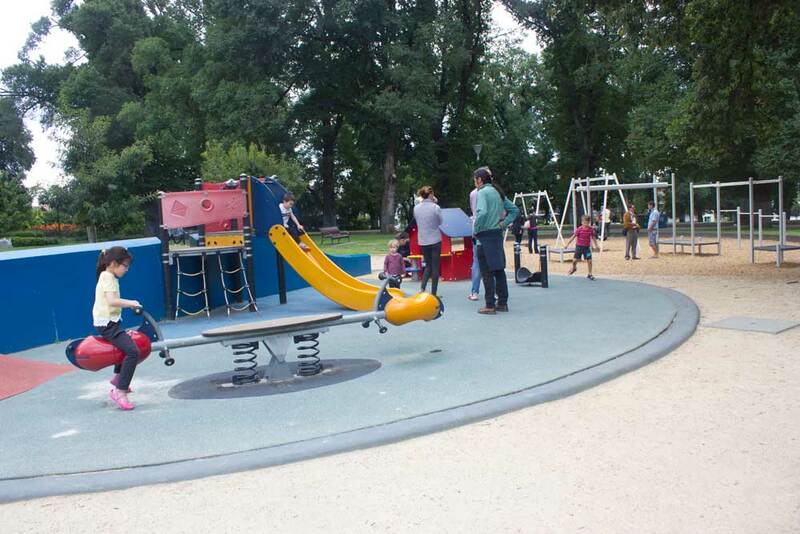 A great park for both littles and bigs, there is enough equipment on ground level to keep your young’uns amused. The double wave slide is also short enough for you to stand and hold your babies from the top, and there is one baby swing and smaller seesaws for when they crawl off. It’s popular with parents and carers with children that range in age, but If you’re looking for a smaller park in general, you can’t go past the setup on the other side of the lake next to Curators Collective cafe. 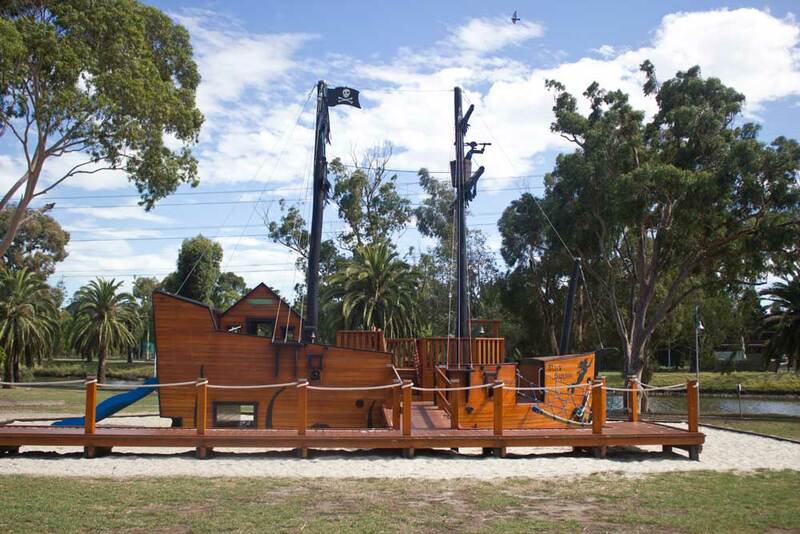 Your little pirates are sure to love the giant ship Calypso at Casey Fields, in amongst all the other easily-accessible equipment for under-threes. Climbing mounds, adventure hill with birds nest swing, and even interactive art abounds to keep your smalls occupied across the three hectares. The play gyms and sandpits are popular, but the best fun of all is the giant blue slide snaking its way down the rubber climbing hill, which even tiny tots can manage. One of my kids’ favourite parks is just a short tram ride away from our house, adjacent to the Royal Children’s Hospital in Parkville. 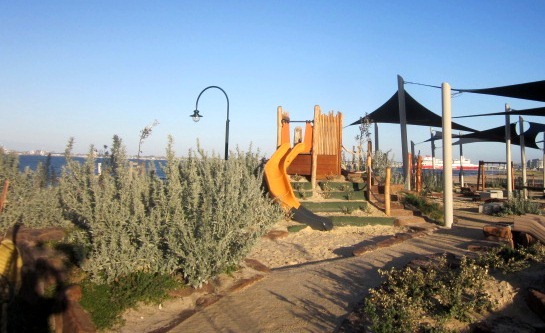 It’s easy to see why – named Australia’s best playground, it not only is awesome fun to run, jump, climb, and play in, but it also builds kids’ resilience by providing an element of managed risk. The equipment is as natural as could be made, in the efforts to help inner-city kids reduce their nature deficit. In amongst the 1200 trees, grassland and gullies are a series of rope climbing frames, a water play area, swings, and even a cool little cubby to hide away in. There isn’t a ton of traditional playground equipment, but kids would be hard-pressed trying to be bored here. 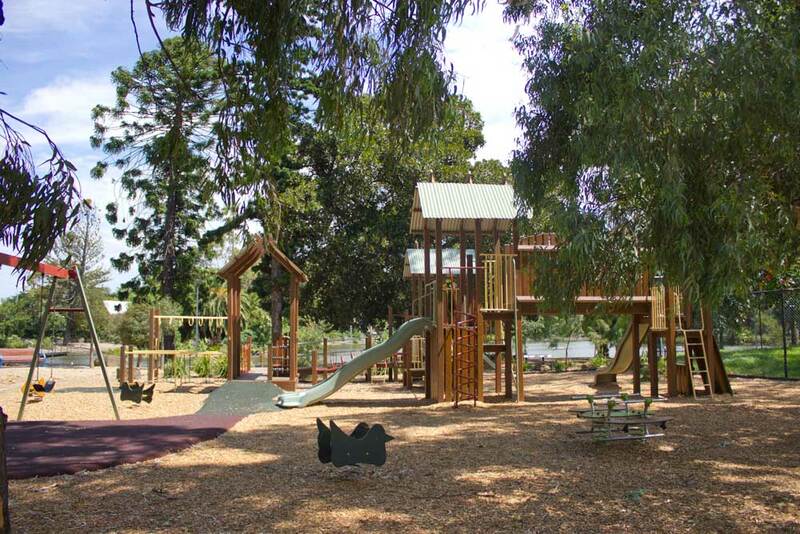 If you’re looking for a fully fenced playground in the south, Plum Garden is for you. Besides the cute name, it has a harnessed swing, climbable boat, spinning carousel, pretty low-key “trampoline”, and plenty of other things to keep little ones occupied. We love the birds nest swing and the slides that end up right in the sandpit (with bonus digger!) and the general beachy vibe. One of Melbourne’s biggest playgrounds, Carlton Gardens is also one of Melbourne’s best. Even I have a good time climbing through the structures, crawling through the tunnels, and flying down the slides! 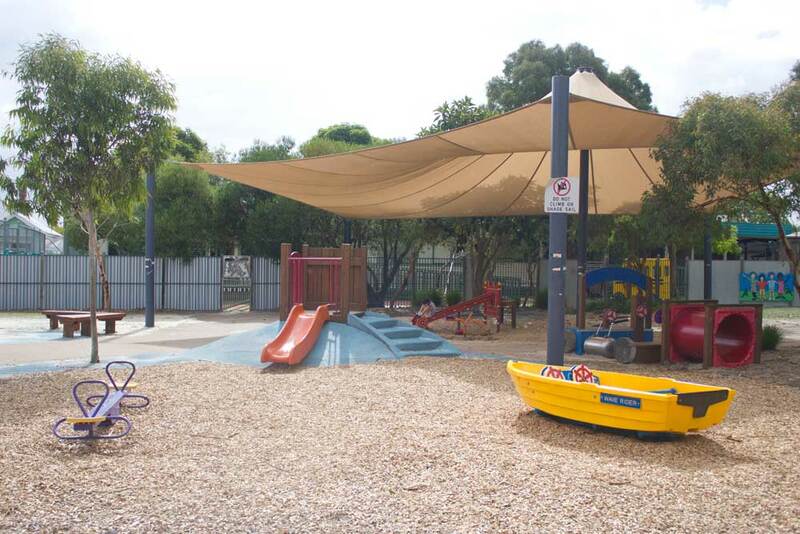 For preschool kids and under, the area away from the hustle and bustle of big kids has a rubber crawl area filled with tiny delights – a cubby with a slide, seesaw, swings, climbing wall and small sandpit. Plenty of green space to run around in or pull out a blanket for baby, and the gorgeous European trees that change with the seasons provide plenty of shade, as do the giant Moreton Bay Figs. Hays Paddock is such an amazing, inclusive park suitable for all ages and abilities. With extra-wide seesaw, slide wooden climbing frames, rope trampoline, and even a little enclosed jetty to hang out in that faces out into the wetlands. 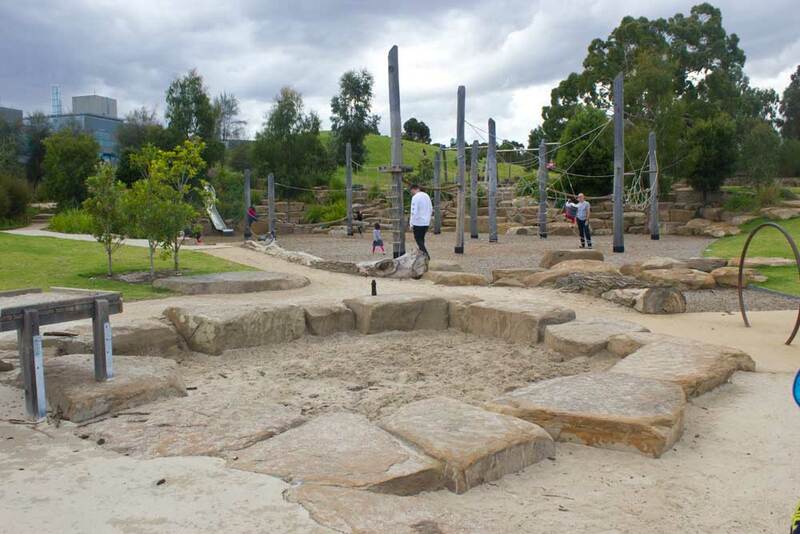 The sensory experience the park provides is amazing – set in native bushland with all its sights and sounds, with musical equipment, coloured windows that cast a fun hue on the view, and huge sandpit area. Being fully fenced is a huge bonus, as is the seating and BBQ facilities nearby. Plenty of shade and toilets make this a popular playground choice. So much nautical fun to be had on the banks of the Maribyrnong River in the intrepid Black Sapphire! Walk the plank, ring the captain’s bell, or check out the horizon through the telescope – you have to know in which direction to steer the giant wooden ship’s wheel! All that surrounds you is sandcastle-making sand, but if the little ones have sailed enough of the ocean blue, there’s also regular playground equipment alongside. Another of my kids’ favourites is the ever-popular South Playground in Edinburgh Gardens (the Alfred Crescent end). Fully fenced (but also full of features, so visibility isn’t great of kids who are in a different area of the park) and full of fun things to do for all ages, the park is often frequented. The toddler area is quite protected from the rest of the equipment and has a seesaw, slide, and little spinning lotus. Around the corner is a sandpit and rope climbing frame. 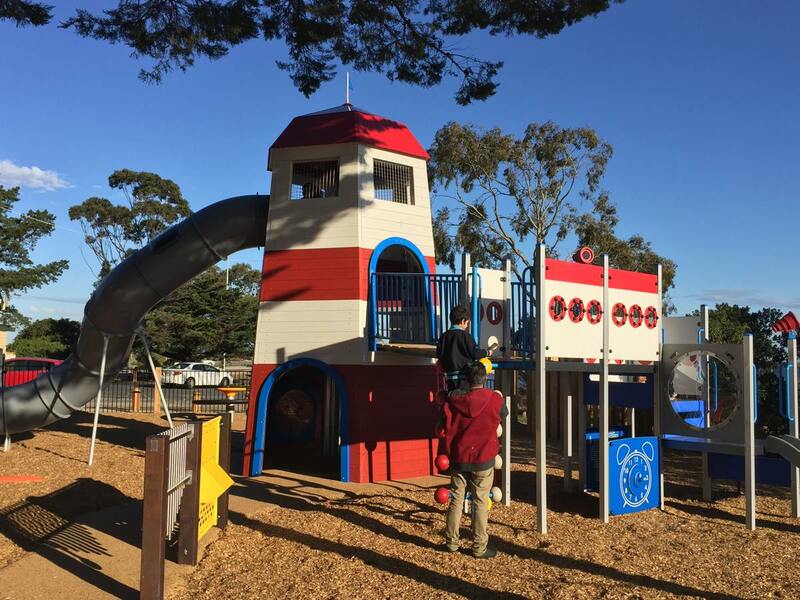 The main wooden structure has everything you’d expect – monkey bars, slide, vertical rope hanging discs, walkways, and ladders but also features a scramble wall and a height measure, so is better for older kids. There is a harnessed swing and plenty of seating. The toilets are a stone’s throw away but often busy and not terribly well-kept, so bring wipes. The ovals and parkland nearby are awesome for running and ballgames. 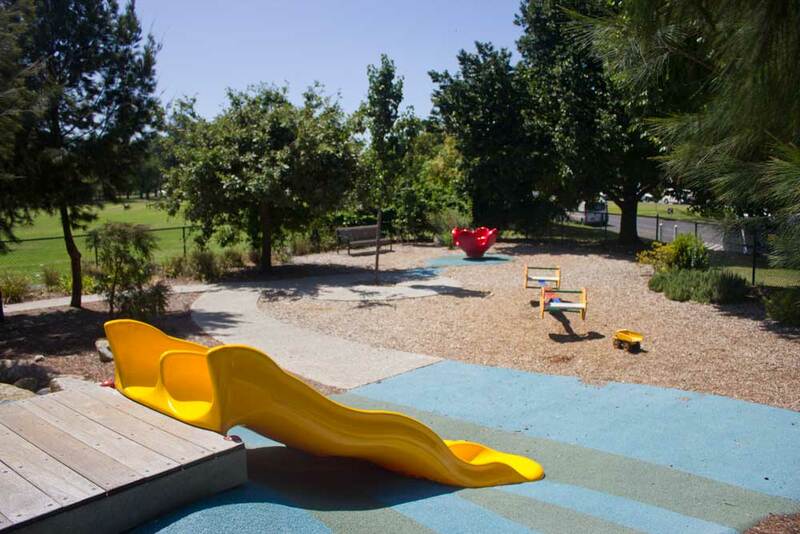 Harmony Park is set in a huge reserve with plenty for all ages of children. There is a great rotunda for parties, picnics and barbecues, plenty of water and toilets, and even a skate park for the brave. I love the natural landscaping and the wide open spaces of green grass to run as fast as you can in. The facilities for babies and toddlers are bright and easy to get around in, and the undercover sandpit with digger and conveyor belt is a big attraction. The rest of the park features swings, a hammock, musical features, huge wooden playhouse with tunnels, rope bridges, slides, a climbing fort, flying fox, monkey bars… it’s fabulous for kids of all abilities.